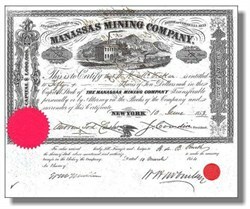 Beautifully engraved certificate from the Manassas Mining Company of Virginia issued in 1853. This historic document was printed by the Robertson & Seibert Laith and has an ornate border around it with a vignette of a train passing by a mining town. This item is hand signed by the Company’s President, Joseph Cowdin and Secretary and is over 155 years old. The certificate looks much nicer than the scan indicates. This stock was issued 8 years before the first battle of Manassas which was at the beginning of the American Civil War. Manassas is a city in northeastern Virginia and was incorporated as a town 1873 and as a city 1975. It is the seat of Prince William County, but is administratively independent of the county. The city is a residential center in the Washington, D.C., metropolitan area, with some light industry. During the American Civil War Manassas was an important rail junction. The two battles of Bull Run, both won by Confederate forces, were fought nearby, in July 1861 and August 1862. The battle site is part of Manassas National Battlefield Park. The city is next to Chantilly, Virginia which is where Scripophily.com began its Internet business.